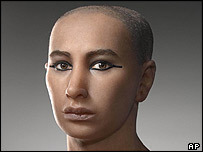 Scientists have carried out the first facial reconstructions of Egypt's most famous ancient king, Tutankhamun. Three teams of forensic artists - French, Egyptian and American - built separate but similar models of the king's face using scans of his skull. The French and Egyptians knew who they were recreating, but the Americans were not told where the skull came from. 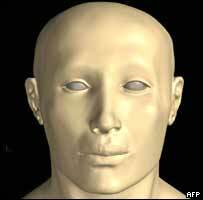 The models of the boy king, who died 3,300 years ago, reveal a young man with plump cheeks and a round chin. The models bear a striking resemblance to the mask which covered the mummified face of King Tutankhamun when his remains were found by archaeologist Howard Carter in 1922 and other ancient portraits. Using high-resolution photos of the CT scans, the US team correctly identified the skull as coming from a North African. A CT, or "Cat", scan involves the use X-rays to map the body. The Egyptian team was able to work directly from the scans, which could distinguish different densities of soft tissue and bone. "The results of the three teams were identical or very similar in the basic shape of the face, the size, shape and setting of the eyes, and the proportion of the skull," Mr Hawass said. "The primary differences were in the shape of the end of the nose and ears," he added. The French and American versions had similar noses and chins, but the Egyptian team gave their reconstruction a stronger nose, the council said. The CT scans - the first ever done on an Egyptian mummy - were carried out in January this year. They suggested that the king was a slightly built, but healthy man of 19 when he died, but that he most likely died of complications from a broken leg, rather than being murdered as long suspected. When the body was x-rayed in 1968, a shard of bone was found in his skull, prompting speculation that he was killed by a blow. 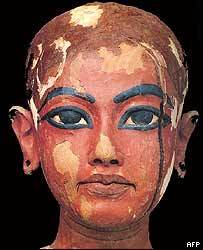 Little is known about Tutankhamun's 10-year rule after he succeeded Akhenaten, who had abandoned Egypt's old gods in favour of monotheism. Some historians had argued he was killed for attempting to bring back polytheism. Others believed he was assassinated by Ay, his second in command and the man who succeeded him. But Mr Hawass said he was confident that Tutankhamun, who died in 1352 BC, was not murdered.